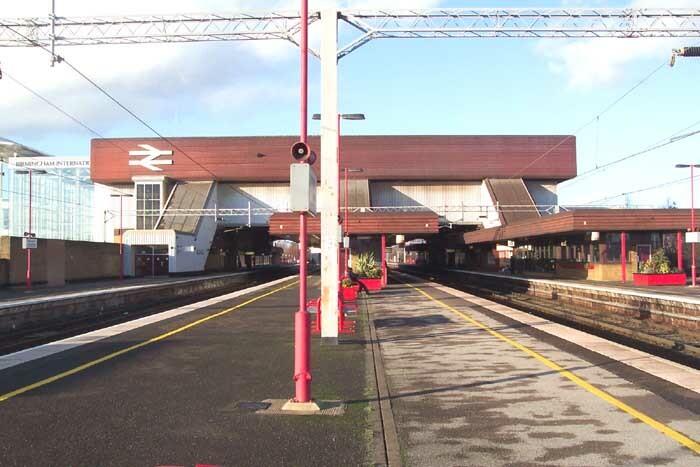 Birmingham International station was opened by British Rail at the same time as the West Midlands was waking up to the fact that local rail services had their uses eg: the Cross City Line soon to open. 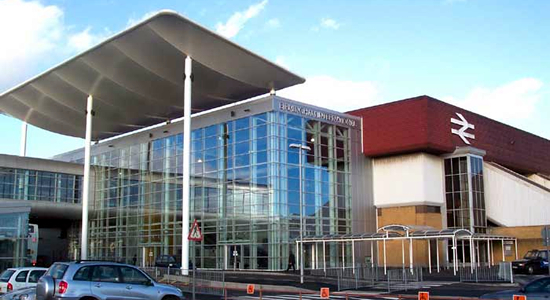 The Bickenhill site upon which it stands was being rapidly developed as the National Exhibition Centre complex and in 1974 the newly formed West Midlands Metropolitan County Council had taken over the rapidly expanding Birmingham (Elmdon) Airport. It was evident that public transport needed to be significantly improved and, for once, rail was seen as the answer as there was already the ex-LNWR's New Street to Euston line running through the site: hence, the station was born. Above we see the impressive frontage to the now Virgin run station on Station Way. Above-left we are in the station car park looking at the station and its connection upper-right with the overhead cable-drawn 'railway' link with the airport complex several hundred yards behind the photographer (see also Train Photos page). 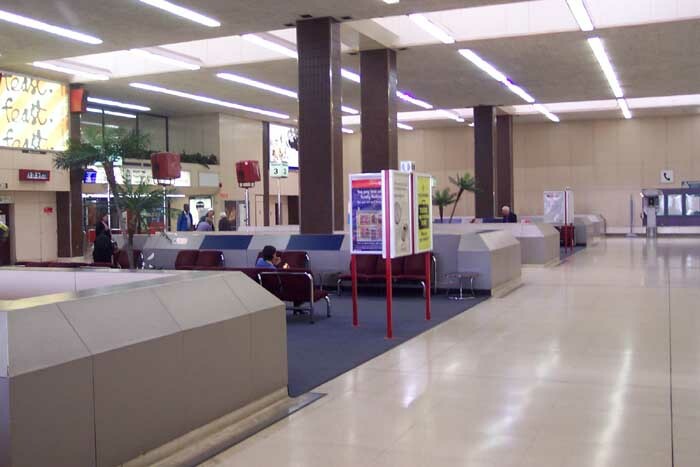 Above-right we see the waiting area from which the plaforms are accessed to the right - to the left is the main concourse which runs through to the NEC. 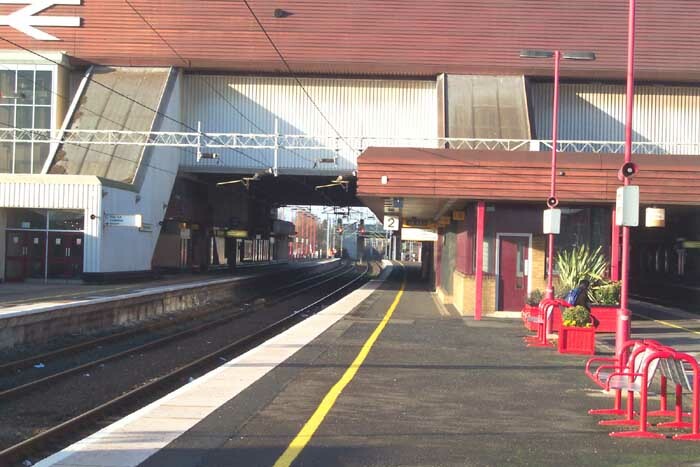 When you enter the station through the entrance shown at the top of the page you have to go up to the concourse which is on the first floor and into the waiting area then down to platform level. 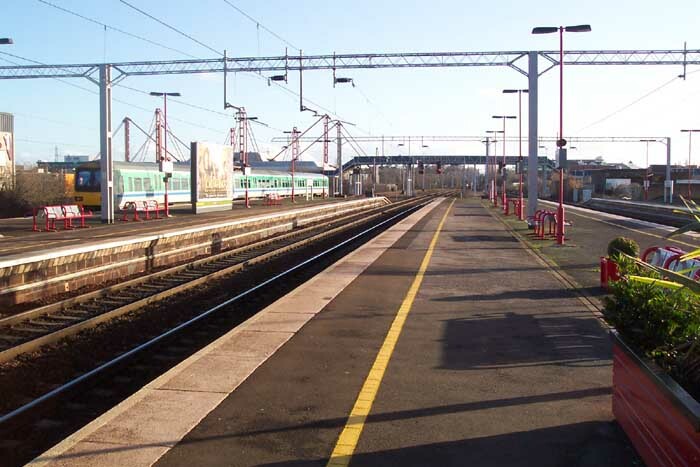 Above-left we are on platform 2 looking at the station building in the direction of Birmingham. Above-right we are in the same spot but looking to platforms 3 and 4 again in the direction of Birmingham. This is a large station with platform facilities as well as a bar/cafe in the waiting area upstairs however, it does have a bit of a 'New Street' feel to it which is somewhat unfortunate: built in the middle of nowhere with loads of land to spare and they still had to stack floors above the platforms making them dark and depressing! 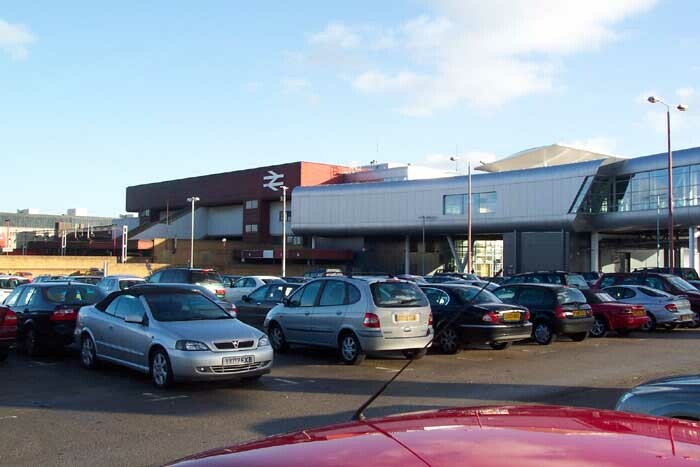 Above-left we see the whole station from platform 2 - note the huge BR logo. Above-right we are again on platform 2 but looking towards Coventry. As a word of warning to anyone intending to visit by car: the long stay car park charged £5.00 for 45 minutes - 20 of which were spent trying to locate a machine to pay for the parking so I could get out! If you do park there, the pay machines are in between the concourse and waiting room shown above cunningly concealed behind a screen - further more, Virgin's car park charges are not displayed in the car park. Anyway, other than that it is worth a look around but is a little characterless and sterile compared with those stations of a pre-grouping and/or pre-nationalisation pedigree.